A eulogy for NASA's Cassini spacecraft, which ended its mission to Saturn on Sept 15. 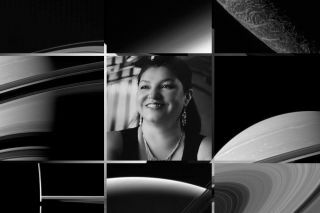 Space.com writer Doris Elin Salazar connects her mother (pictured here, center) and Cassini's journey. The end of Cassini has made me sentimental over the last few weeks, and I keep trying to wrap my head around one question: Why? Why do I feel empathetic for a nonsentient spacecraft? It reminds me of my immigrant mom, Sonia. Cassini ventured into an unknown place, and I process that journey as courageous, as I do my mother's story, of a young woman who migrated to the United States from South America in 1987. The Cassini mission had few hints of what Saturn would be like before departing, like many immigrants who know little of where they are relocating to, where they may live out the rest their lives. Cassini sent back treasures, in the form of images and information, to those across the border created by the large distances in our solar system, the gap that keeps those of us back on Earth from visiting Saturn ourselves. All the hopes of a research mission or a family, carried on the back of a singular vessel. I know she does things because they provide for me and my future. Sometimes when she faces this world with her accent, or sends a digital signal to her sister hundreds of miles away, I know that she is reminded of how alone she is in her new country. When Cassini passed Enceladus' aquatic plumes, I imagined the probe as a humble yet valiant being that found itself occasionally thrilled by something extraordinary in its new world. And I remembered how my mom earmarks experiences to one day show her family, those who equipped her for the unpredictable journey and who made her who she is. Cassini kept on going, and like my mom, keeps making humanity proud.